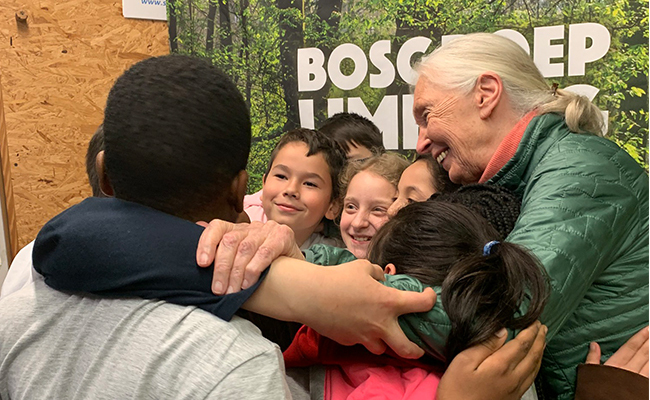 Jane Goodall visited us in Belgium in March 2019 and shared her vision and message of hope. Daily she inspires people to make a difference in the world and we were delighted to have her do this for us in Belgium. On Saturday, March 16, Jane visited the very first forest in Lauw the JGIB volunteers planted during the “Forest in One Day” event. This forest was planted back in 2015 and although the trees are still growing, Jane was very excited to be there. Of course, we had with us fifty children who shared our enthusiasm and enjoyed all kinds of workshops organized by the JGIB Roots & Shoots team. Among the children were the scouts of Rutten, pupils of BuSo Sint-Niklaas, children from the schools Notre Dame de Lourdes in Brussels and the primary school Jeugdland in Tongeren and Lauw. The children spent the morning in the forest learning interesting facts about bats, hedgehogs, bees, butterflies and of course birds, because our swift expert Martine was also present. The other workshops were given by R&S coordinator Tania, JGI volunteer Jens and our National Youth Leaders Tilli, Lus, Lena and Toon. From now on, “sonar” and “cocoon” are no longer strange words for these children. From now on, they will also be able to recognize a number of birds by their specific sound, they will be much more respectful to the bees preserving our nature and of course, they will treat the hedgehogs in their garden very carefully. These young people were very proud to share their knowledge from the workshops with Jane. And what did they learn from Jane? 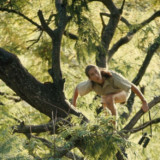 How chimpanzees behave in the wild and how they can imitate their sounds! Do you want to know what this image looked like? Then be sure to watch the VRT news broadcast. 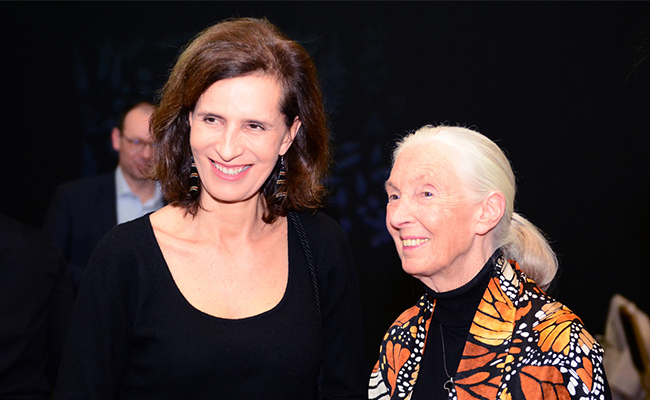 With a head full of new knowledge, a photo with Jane and the call of chimpanzees, the children returned home. 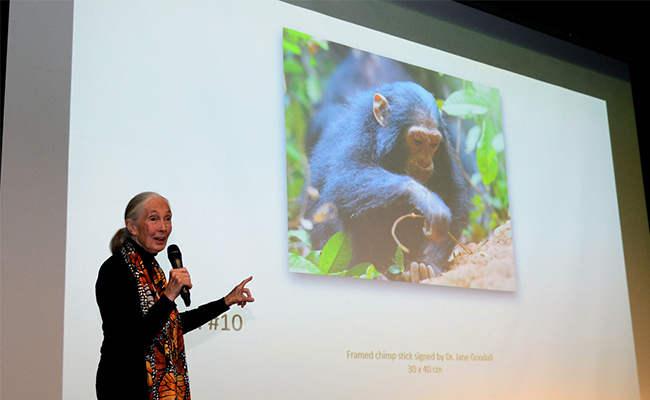 The volunteers of Jane Goodall Institute Belgium had the opportunity to share a cup of tea with Jane, presenting themselves, talking about their projects and listening to Jane sharing inspirational stories. 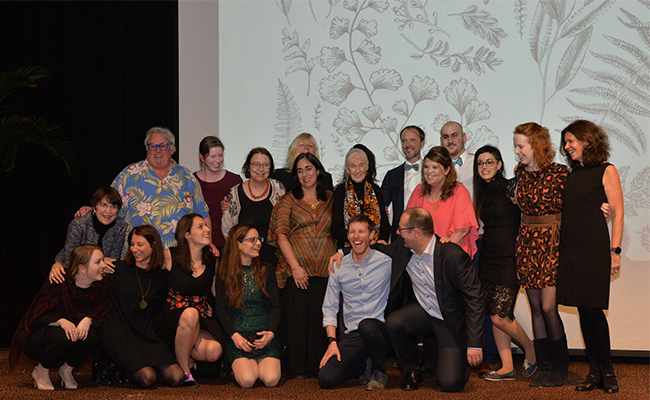 Dr.Goodall thanked everyone for their great work and passion and reminded them that each one of us matters, has a role to play and makes a difference. To mark Jane’s return to Belgium, her commemorative birthday and our partnership with Koen Timmers, a Belgian teacher, author, keynote speaker and founder of the Innovation Lab Schools Project, the JGIB organized an exclusive gala dinner and art auction at the beautiful Martin’s Chateau du Lac in Genval. This evening brought together, among others, HRH Princess Esmeralda of Belgium, Beverly Jo Scott, Félicien Bogaerts and Grégoire Dallemagne, CEO of Luminus. We also had the honour to have in our midst Koen Timmers, founder of Innovation Lab Schools and Federico Bogdanowicz, the executive director of the Jane Goodall Institute Spain’s community conservation project in Senegal. All proceeds of this special evening is to the benefit of these two incredible projects. 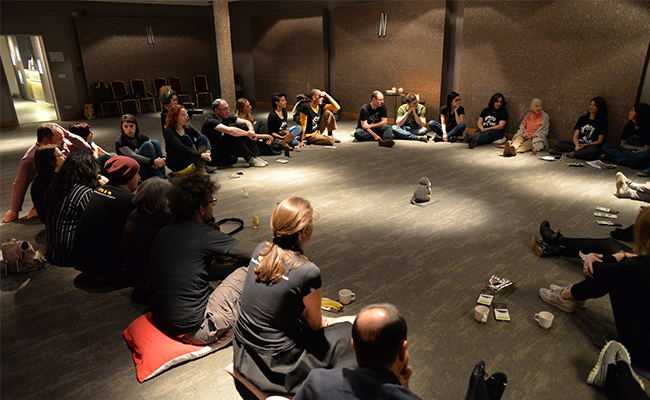 The evening was a great success thanks to the enthusiasm and warm spirit of everyone who attended the event! We would also like to take this opportunity to thank auctioneer Stephane Cauchies and artists Yann Artus-Betrand, William Sweetlove, Christiaan Laurent, Michel d’Oultremont, Caroline van der Wegen, Tania Dreelinck and Frederic Demeuse for their kind generosity in sponsoring their exquisite art pieces. Also a heart felt thank you to our sponsors John Martin Hotels, Les Terres d’ici, Despert & Co and Groot Constantia Wines. 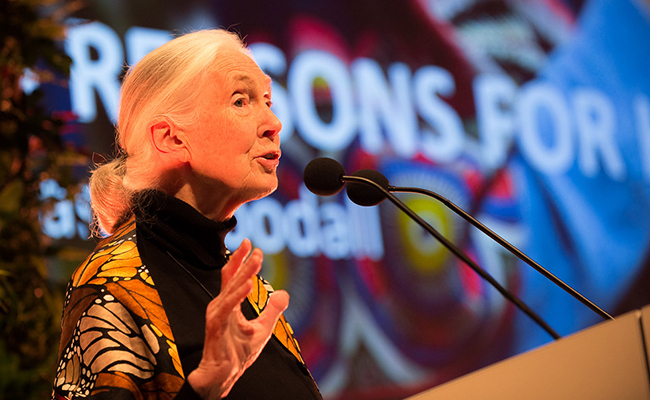 During her speech, Jane Goodall talked about her fight for the protection of animals, human beings and the environment. 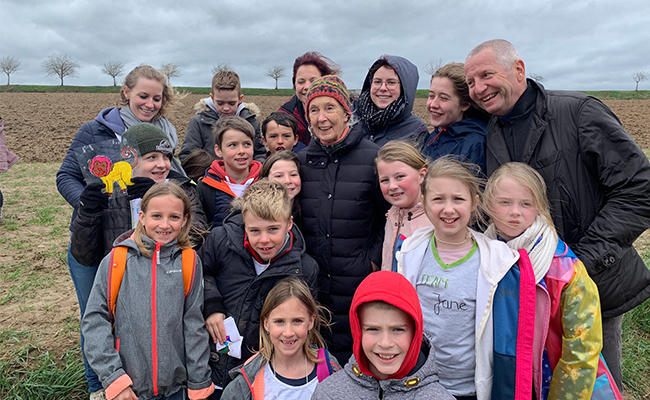 Noting every day the consequences of global warming, Jane Goodall remains optimistic when she sees young people manifest and plant seeds of hope. Each individual act can help to reverse the current trend and build a better world. Jane also shared several stories of her life. Contrary to what one might think, the first animal she had studied is not the chimpanzee but her dog, Rusty. “Rusty made me understand a lot about animal behavior. He gave me lessons that I have never forgotten. He taught me that dogs are capable of reasoning. ” Since then, she has never stopped being passionate about animals. Recently, Jane is intrigued by Pig Asso, a pig saved from slaughter and became an “artist”. 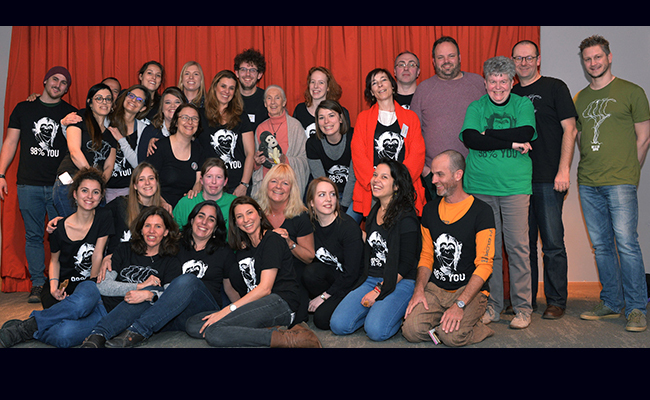 Established in 2005, JGI Belgium today has around 70+ active volunteers that work together to bring to life Jane’s dream to live in harmony with nature. We believe that JGI Belgium can make a difference through our focused approach on forest planting actions, youth empowerment programs (Roots & Shoots) and animal protection projects in Belgium and Africa. We plant up to 8000 indigenous trees in Belgium each year to create a forest. For every tree we plant, we sponsor the planting of several trees in one of our community conservation and reforestation projects in Africa. 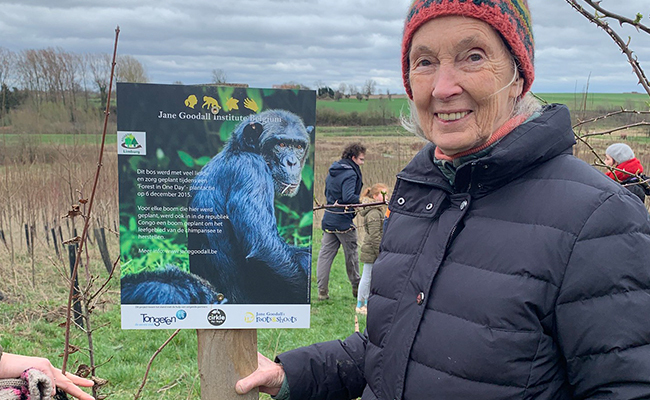 To raise awareness of the importance of reforestation to combat climate change, the Jane Goodall Institute Belgium has also partnered with Luminus and Bosgroep Limburg. Daily our volunteers and sponsors work to bring Jane’s dream to life. We are proud of our efforts. They make a difference to local communities each day in Belgium and Africa.